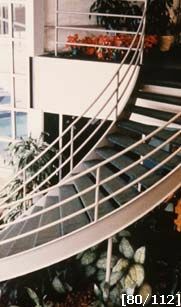 This is a custom-curved staircase with a 3 line rail system. The stair was built with a heavy a duty MC 10x 8.4 stringer, and an inside radius of 5', and an outside radius of 9' to the center line. This left the tread width at 48" with a 17" run at the widest point, and 7 1/2" at the narrowest point. The treads are made from 12 gauge smooth steel. The rail system is made out of 1 1/2" .065 round tubing with the posts spaced an equal distance from the bottom of the stair to the top. The handrail is 34" high from the nose of the tread to the top of the handrail, and the intermediate rails are spaced equally. The balcony rail is 42' high from the floor to the top of the rail and is manufactured with four vertical line rails to match the stair railing. The staircase was fabricated at the plant to exact measurements and shipped in one section ... ready for installation. This type of stair can either be bolted or field welded in place. A light gray primer was applied at the plant with carpet and finish paint applied by others.